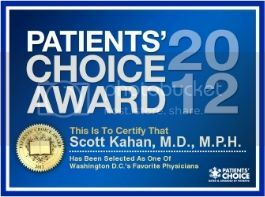 I have never met a medical professional who is as dedicated to the overall well-being of his patients as Dr. Scott Kahan. Dr. Kahan has not only met with me regularly to help me improve my physical health over the past three years, he has met with my husband, my psychologist, my husband’s psychologist, and my nutritionist to coordinate the best possible holistic care for me and to help me navigate several major life changes. Since starting to see Dr. Kahan, I have lost 100 pounds, met and married my husband, become a fan of biking to work, and learned to ride the rollercoaster of managing my weight while catching the curveballs life throws at all of us – all largely thanks to Dr. Kahan’s extraordinary care. I have been his patient for three years, and I continue to be amazed by his ability to see me as a whole person, with physical and emotional health concerns that go beyond my weight. When he meets with a patient, he is fully present, listening to her concerns, sharing his own experiences when helpful, and connecting on a human level, while providing outstanding medical care. He takes seriously the reality behind the rhetoric of how important it is to have a “relationship” with one’s doctor, and he has made it easy for me to feel comfortable trusting that he understands my concerns and struggles and is eager to help me in any way he can. I first met Dr. Kahan when I went to him to lose weight. At the time, I weighed over 300 pounds. He helped me lose about 100 pounds, but more than the weight loss, he helped me learn to think about living a full, healthy life, to accept the ups and downs of living with a life-long process of working to find a balance that is right for me. He has taught me how to take care of myself with as much patience and nurturing as he shows in taking care of me. Life in general brings many changes, and weight loss can bring changes even more quickly than usual. Two years ago, after losing much of my weight, I started a new romantic relationship, a change that turned all of my habits and emotions upside down. Dr. Kahan coached me through managing the new challenges that the relationship presented for my eating and exercise plans, with an endlessly supportive, understanding sympathy for the very human challenges of life’s curveballs, both good and bad. As my relationship progressed, I discovered that my husband had a great deal of anxiety about doctors and, as a result, had avoided medical care for decades. Dr. Kahan helped me identify a primary care physician within my health insurance network whom he knew would suit my husband’s needs. Additionally, Dr. Kahan himself has met with my husband and his psychologist to work out a plan for his medical and psychological care. I am a physician with many years of experience in caring for patients. When I found that I needed help – as a patient – I realized that I was not used to being in this role. 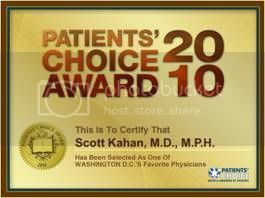 I came to Dr. Scott Kahan as a patient in the summer of 2010. I actually live about 4 hours away from his office, but I felt that it was worth the drive to work with him. Initially, being a patient, rather than a caregiver, was difficult for me. But Dr. Kahan put me right at ease. He made me feel like I had “permission” to seek his help, advice, and encouragement. It was a unique experience that I came to really enjoy, being a patient and not the expert on hand to solve problems for others. Scott Kahan is an incredibly caring and thoughtful individual. His professionalism and bedside manner is excellent. His personality is such that he clearly cares for his patients and is always “in the moment” as he listens and gives to others. His understanding of evidence-based medicine is excellent, and he communicates it very well to patients. His ability to understand and connect the gap between what we know and what we actually feel and do cuts to the core of the issues at hand. I’ve now been seeing him for more than a year, and I lost nearly 50 pounds. More importantly, I am more healthy and have more energy to give to others and to enjoy life for myself and my family. I also have a feeling of confidence in my ability to continue to manage my weight and my health indefinitely. There are not too many times in life where meeting someone and spending time with them can make you a better person. I have had one of those unique fortunate experiences where working with Scott has been a catalyst to improving my life. Dr. Kahan doesn’t have a magic wand. He doesn’t have a magic pill. But he does have a magic way of helping you break through whatever is holding you back from being a healthy, happy and confident person. When I drive to his office, I pass a strip mall with a storefront that has “My Weight Doctor” in big, bold white letters over the door. And the first time I went to see him, I thought that was what I was getting in Dr. Kahan. Boy, was I wrong. He is not selling a quick fix or fad diet. In fact, weight is rarely what we talk about – our discussions often focus more on how I see the world rather than on how the scale sees me. By taking the emphasis off what the scale says and putting it on the roots of my issues, I’ve become more focused on my overall health. His unique approach of looking at the underlying factors that contributed to my poor health was a revelation, and, to be honest, a bit scary. Opening up about the issues that helped me get to the point where my weight was dangerously high was an intimidating prospect. I approached that first conversation with fear and trepidation, which lasted about five minutes after I sat down with Dr. Kahan. He pulled out the details of my struggles with gentle questions and insightful comments, never once making me feel judged. He empathized with my struggle, sharing a little of why he choose this field, which helped me realize that he does “get it” and this is not just a job to him – it is a calling. As we have worked together, Dr. Kahan helped me see that it is not just a matter of “calories in, calories out.” While that is a part of it, I needed to understand why the calories go in, and why they don’t always go out as expected. Life is complicated. There are things I can control, like if I stop at McDonald’s on the way home. And there are things I cannot control, like when I found a lump that required a biopsy – stopping for some comfort food on that day helped me get through a really bad time, and I know now it is ok for that to happen on occasion. Before Dr. Kahan came into my life, I would have made myself feel even worse over a few slices of pizza than I did about the pending test results. Many of the doctors I’ve seen in the past treated me with contempt, spoke to me as though I were stupid, or dismissed me without hearing when I asked for help. 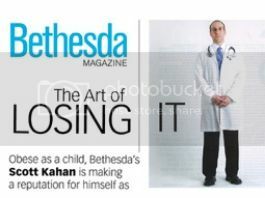 Dr. Kahan had to overcome my years of distrust for physicians. During the months we have been working together, Dr. Kahan has become someone I trust completely. He is honest about the pros and cons of different actions we can take, and is careful to follow up to make sure things work in the expected way. If something isn’t working, he is the first to help me reason through the reasons why, and to suggest a new course. He is so creative in approaching the problems I face, and in finding solutions. And when he does not have an answer for me, he has a trusted network of experts that he happily turns to for answers. Each time I leave his office, Dr. Kahan always reminds me to call him during the week if I need him. Having that option is a big help. But after the first time I saw him, I was surprised to get a phone call from him, just checking in to see if I was doing ok. As time has gone on, he always seems to know when I’m having a rough week, and could use a mid-week check-in by phone or e-mail. Dr. Kahan’s office is not always a happy place. There have been tears and confronting of things I’ve spent years and pounds avoiding. But it is a place I do not regret entering, because it is a healing place. I know it sounds crazy, but losing 100 pounds has almost been a side benefit. My blood pressure is lower, my blood sugar is under control and I have avoided the type II diabetes that is common in my family. There are lots of other positive results in my blood work, which I confess I don’t truly understand but make him smile broadly when we review them. I own my health now. I am in charge of it, and Dr. Kahan is my partner in my efforts to become a healthier person. He is my guide to where we go on this journey, not a dictator. Dr. Kahan has helped me to see that I need to focus on being healthy before I worry about my weight. And while we are still working on it, I believe together we’ll find the switch the will make me able to fully conquer the health issues I can influence. I owe him more than I can say for the life that I am now truly living, not just drifting through. I have been a patient of Dr. Kahan for several months and it has been transformative for me. As a middle-aged professional woman, I have tried many well-known weight loss programs and while successful in the short-term, I reverted to old behaviors and, like so many others in the same situation, was not successful in the long-term. I was beginning to lose hope but still wanted to do something to change the “bad” behaviors. Dr. Kahan has helped me to modify my definition of success by focusing on healthy lifestyle behaviors rather than weight loss, by seeing me as an individual rather than rushing to a quick judgment of which “diet” program I need to get started on, by focusing on the “big picture” of my life instead of one part that is just about food, and by focusing on the positive means to live a happy and healthy life. He wears a multitude of hats in our conversations, from doctor to researcher to policy expert to counselor to nutritionist to fellow human being, all combining to make me feel a sense of hope for the future and motivation to enhance and continue my healthy lifestyle changes. He does not insist on or advise about absolutes that may work short-term but fail long-term. 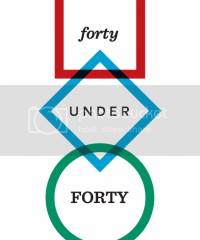 Instead, he suggests ways to understand, evaluate, modify, and meet life’s daily challenges. He does so with a caring and compassionate style of conversation, supplemented with books or articles that provide insights (and he will find the books that are right for each patient). He cares about what goes on in my life and takes the time to understand me as a person, not as a number, thus allowing a tailored approach to development of goals for me and my life. He is helping me to take control of my life in the one area that has been my greatest struggle, in a way that is comfortable and sustainable. I met Dr. Scott Kahan in November 2009. I had gone to his clinic to seek help in dealing with a lifelong weight issue. I’ve been overweight for much of my adult life, and while I have lost large amounts of weight in the past, there seemed little I could do to lose the weight and then keep it off over a long period of time. I had been to weight doctors and dietitians before, but Scott was different in many ways. He primarily spoke of health, not weight. He spoke of life changes, not diets. He spoke of his own struggles with weight and health in his early life, and seemed like he understood the struggles of dealing with chronic weight issues in daily life. Most importantly, he emphasized that there was both short term and long term pieces to this puzzle, and both were critical. I was immediately impressed with him and with our discussions. Scott and I slowly designed an individualized program using several strategies and “tools,” and we tweaked and updated it repeatedly based on how I was feeling, my progress, and the things that were going on in my life. While I know Scott would surely say that weight loss isn’t necessarily the most important part of my diet path, the weight came off quickly. I lost 20 pounds the first month – and I never felt hungry; I just felt better. We kept analyzing my progress and tweaking as necessary, and by the end of the second month, I was down over 35 pounds. By the end of the 3rd month I had lost nearly 50 pounds. My blood pressure, cholesterol and blood sugar counts were falling to normal levels. I went from taking three blood pressure mediations a day to one (and I only take half of that medication now). Scott’s weight management program changed my life. I call it Scott’s program because the “diet” (which was never called a diet) was only part of it. Most important to me were my weekly sessions with Scott in which we went over everything in my life. We discussed food and how we were adapting the diet to my lifestyle. We discussed how jobs, family, and other aspects of life impact weight, and how to make it all work together. He cautioned and counseled me about trying to be too “perfect” with dieting (like counting calories from healthy foods like fruits and vegetables). It was more important to Scott that I eat healthy – and sustainably – and enjoy what I eat, rather than maximize weight loss. Health – not necessarily weight – was what we were seeking. This was not a diet; it was a new way of living. It has now been over 18 months since I began my new way of living and over a year after I reached my “goal” of losing 50 pounds. I feel better than I have at any point over the past 30 years. I now see Scott every two months. I am “up” about 4 pounds over my lowest weight. It is typical of Scott that he does not care about that. His first question, always, is “How do you feel? Is your life going the way it should?” My blood pressure, cholesterol and blood sugar levels are normal. We often don’t talk about diets or even about food. We talk about health and life, and how to continue living my life while also managing my health. I will see Scott regularly for the rest of my life. I am committed to that because I am still the guy who could eat an entire pizza at one sitting or eat an entire gallon of ice cream late at night. What changed is not my mental makeup or my cravings; what changed is that I have a doctor who cares about me, about my health, and about my future and a system of eating and living that keeps those cravings under control. I have someone I can talk to at any time, by phone or email, who understands weight problems yet views them differently: weight is not the problem to be solved. What needs to be solved is a patient’s health, and weight is only a part, albeit a major part, of a person’s health. We fail and we succeed based not on how much weight we lost but how much better we feel and how long we continue to feel better. More than anything else, Scott understands. As someone who has struggled with weight issues much of my adult life, and worked with a number of professionals over the years, I can truly say that Scott Kahan is unique in his field. Dr. Kahan is a partner in a process that is about more than simple calories in / calories out. He has an empathetic understanding of the reality of day-to-day life and how that impacts weight loss — and general health, mental and physical. In fact, the core of Dr. Kahan’s approach is about respecting and valuing the total individual, and his practice is not about “weight-loss” but about healthy living, which includes weight-loss, but is not limited to it. I feel that I work with Dr. Kahan, or perhaps more accurately, he works with me. Over several years that I’ve worked with Dr. Kahan, he has never treated me as one of many patients, but rather as an individual – he takes the time to sit and discuss issues, he is accessible at all times (I have had many a weekend email returned quickly, and phone calls scheduled outside the normal business hours), and most importantly, he has been 100% present in every conversation I have ever had with him. It is nice to have a Dr. who I not only like, but whom I also respect – and who respects me. I have had Type I diabetes for 20 years, since I was a child, and I have several of the attendant complications. I had all of the pieces to live a healthy life, but they just weren’t coming together the way I wanted. I exercised, I watched what I ate, I tested my sugars regularly, and I took my meds on time. I was reaching my wits’ end with my own lack of progress reaching my goals. Finding help in this situation was difficult. I needed someone familiar enough with my disease and the biochemistry that goes with it to make more than the usual lifestyle change suggestions. Luckily, I stumbled across Dr. Kahan’s email address. I sent him a short message about how frustrated I was, and how difficult it was to maintain the things I knew I should be doing when I was seeing no results. Within a day, he invited me to come in and chat, and I made an appointment for the next week. I was a little hesitant prior to the first appointment. I didn’t know what to expect, and I am not comfortable when doctors judge me if I don’t do everything “right,” or who think they know everything, or who won’t collaborate with my other doctors. I had doctors like that growing up, so I am usually very picky about my doctors. During that first appointment, it didn’t take long to realize that Dr. Kahan did not have any of these negative attitudes. When I explained my situation to Dr. Kahan, he responded positively. I told him that I needed a ringleader, someone who could look at the information I provided, and the pieces I had, and tweak them so they were working together in ways that would get me closer to achieving my goals. He was very supportive of this idea. He understood that people in my situation had been educated more than enough, and know our diseases inside and out, but that there were ways in which he, as an MD who had experience with Type I diabetes and weight management, could offer perspectives and suggestions that I had no way of developing myself. He also suggested I approach the appointments with him as the beginning of a long-term partnership, and he let me set the frequency with which I came to speak with him. His friendliness and acceptance that I had my own specialized body of knowledge, as well as his willingness not to put me into an existing mold put me at ease quickly, which is essential to me when working with my medical team. I met Scott Kahan through my wife, and quickly got to know him quite well. Beyond being a clinician with professionalism and expertise, he is gregarious, likeable and welcoming. Dr. Kahan’s care is not limited to weight management. He took the time to meet with us as a couple and to discuss both weight management issues and peripheral issues that affect our relationship. Our conversations with him as a couple were far more enriching than I expected. 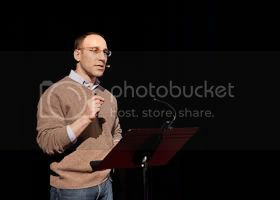 He discussed the complicated emotions related to eating and the cycles of behavior that result. While I don’t have typical weight issues like my wife and other patients he sees, I realized that I have my own food-related emotions and habits that can lead to poor health – as everyone does. He gave me perspective on what my wife was experiencing and how my own habits and choices affect her. I have struggled with my weight for my entire life. As is the case with many of life’s significant challenges; a supportive and helping hand is the key to overcoming such an obstacle. However, for myself, finding the kind of compassionate and nurturing support I needed to help take control of my life became yet another struggle to overcome. This ended when I came under the care of Dr. Scott Kahan. The care Dr. Kahan provides does not emphasize the calories one consumes but instead focuses on the strength one possesses. With his nurturing guidance and support I have learned to acknowledge the strength I always had (but long denied) that enables me to make the positive and healthy changes in my life that I assumed were beyond my reach. Discovering what “being healthy” means for me is an intensely personal and sometimes difficult journey. Such a journey will produce successes and disappointments; knowing that I will face the good and bad with Dr. Kahan has made it easier to take the necessary steps without the paralyzing apprehension and fear I have felt in past attempts. I know that I will be successful in taking control of my life and health due to my own strength and due to the unwavering empathy, support and care I receive from Dr. Kahan. “Dr. Kahan is the best doctor I’ve had in my life. He takes plenty of time diagnosing conditions and working with me on solutions/treatments. He researches my issues in his spare time and follows up with me outside office hours to make sure I am doing OK, particularly this summer when a separate condition requiring bed rest prevented me from coming to the office to see him personally. He scheduled calls and sent e-mails to follow-up on me and was attentive and helpful during those sessions. You will not find a better doctor in metro DC. 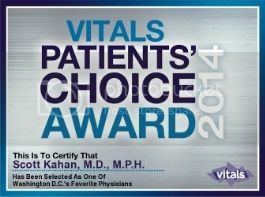 “Dr Kahan is an outstanding doctor. He is thorough, well informed, empathetic, and is focused and pragmatic. He thinks beyond the immediate medical appointment to the challenges a patient faces outside his office and helps find practical approaches and solutions. He is energetic and has a great sense of humor. I find his supportive approach essential to my ability to remain committed to this program and the cchallenges of changin my lifestyle to effect and maintain the weight I have lost. Scott Kahan respects the intelligence of his patients while empathizing with the fear and anxiety that often come with health concerns. He meets each individual where she is, listening carefully and offering more help than most medical doctors, working tirelessly to treat patients with forward-thinking tools and old-fashioned family doctor kindness and individualized care. Dr. Kahan sees the whole person in front of him, not just the symptoms, disease or condition. He sees the specific challenges, strengths, needs, and possibilities for each person. By looking at the big picture, Dr. Kahan is often identifies factors that affect a patient’s health in ways that she may not have realized. He then patiently and encouragingly works with the patient to find ways to make small changes that can make big differences. While he is a medical doctor, patients often feel they are talking to a supportive friend, loving brother, encouraging coach or enthusiastic teacher when talking to him. Dr. Kahan is absolutely fantastic. He relates to his patients and makes it clear he is willing to go the extra mile for your success. He never comes across as judgmental, rushed, or less than present at your appointments. He gets to know you as an individual and caters to your life/personality needs and conveys his wealth of knowledge in a unique package that works for your success. Dr. Kahan is a highly knowledgeable and compassionate Doctor. He is able to address the client needs in a holistic manner – he knows his science, he knows psychology, and knows the complexities associated with weight management. I attribute my success to him. He has changed my view of weight management and of myself. Thanks Dr. Kahan! I do not often find a medical doctor who possesses both intimate knowledge of his field and an excellent “bedside manner.” Dr. Kahan’s compassion and empathy would be notable even if he were something less than he is – an outstanding physician. I credit the doctor with the substantial improvement in my life and believe that countless others do as well. I realize it sounds hokey but its true nevertheless. My e-mail is esavidan@msn.com if you would like to hear more about Dr. Kahan. Dr. Kahan is very knowledgeable in his field. Even more importantly he seems interested in his patients as whole people rather than just problems to fix. We have meandered far away from the immediate problem I came to him with in many conversations and I’m certain that makes him a better doc for me. Would highly recommend him. Scott is an extremely capable and knowledgable physician. I feel that he is my allie in my efforts to reduce my weight and improve my health. With his help I have released over 80lbs during the past 12 months that i’ve been seeing him at the George Washington University Weight Management Program. Dr. Kahan is amazing. He is intuitive, compassionate, and supportive. Even when I’ve gained weight, he gives me a plan of action and concrete steps and, most importantly, is incredibly encouraging. Dr. Kahan is fantastic. He really takes the time to get to know you as the patient, which is very rare nowadays. He is approachable and listens, really taking into account your individual situation. He will also help you with other areas of treatment — from recommending doctors for other ailments, to therapists, to just simple health tips. Dr. Kahan is extremely knowledgeable and genuinely invested in your health and success. Really, I cannot say enough positive things about my experience with Dr. Kahan. Dr. Kahan is not only knowledgable and very smart but extraordinarily supportive and understanding which become are so important when trying to lose weight. In addition, he is willing to examine your individual history and introduce strategies that will work with you. He is a wonderful addition to the physicians of Washington DC. I have been seeing Dr. Kahan for over a year through the GW Obesity clinic. He is a warm, compassionate, empathic and above all, knowledgeable practitioner. I have come to trust and respect Dr. Kahan and his warm, non-threatening style. He spends a lot of time with his patients, and appropriately counsels his patients, most of whom have lived with obesity for their entire lives with a combination of clinical and counseling expertise. I cannot recommend him highly enough and thank him for making my own personal journey possible. My only regret (and this is not a reflection on Dr. Kahan) is that despite the evidence-based approach of his program, most insurance companies do not reimburse for these kinds of services. Dr. Kahan is excellent. He listens to you, the patient. He cites current research and presents you with treatment options. He’s the best! I love Dr. Kahan. I started seeing Dr. Kahan several weeks ago for help with weight loss. Scott Kahan is by far the most compassionate, empathetic, and helpful doctor whom Ive had the pleasure to encounter. Some doctors are good at acting like they care, but he really does, and is full of useful, helpful tips to boot. It is so rare to find a physician who is bright, engaged, genuinely friendly, and so well-informed in his area of expertise. He takes his time and answers any questions that come up, encourages email as an adjunct to office services, and is always available. If youre thinking about seeing him, GO! You wont regret it. Not only is Dr Kahan utterly professional and knowledgeable but understanding and supportive. As someone else on the reviews said: perfect at his job and a wonderful human being. If you’re looking for a dr. to help you with a weight issue and to have a healthier life, this is the person. Dr. Kahans approach to treating obesity and obesity-related conditions should be taught at every health care institution in this country. During my 25 years working in the industry, Ive never met a physician more generous with his expertise, wisdom, and genuine compassion than Scott Kahan. He is a truly nice guy. But most importantly, what Dr. Kahan recommends works: its based on sound medical and nutritional principles, focuses on change that can be sustained for a lifetime, and reflects a heroic effort to understand and encourage the individual being treated. We need a health care system that provides better rewards and incentives for physicians like Dr. Kahan, but until that occurs, Dr. Kahan can at least have the satisfaction of going home every day knowing that he is improving many lives. I am in absolute agreement with every other 5-star review of Dr. Kahan’s work. He is an excellent medical professional. I trust his recommendations and appreciate his caring demeanor. He is exceptionally informed and thoughtful with each and every one of his patients. One of a kind! I trust Dr. Kahan’s professional judgment and his interest in me as a human being. His willingness to explain the basis of his medical judgments, his openness in answering questions and the practical nature of his advice have combined to further motivate me to lead a healthier lifestyle. I have benefited greatly from being his patient. Scott Kahan is top notch. Medically, he is very knowledgeable about the latest research and approaches. Clinically, he is extremely thorough and careful. And on a personal level he is really engages with his patients–he spends enough time with them to understand how their medical issues affect their lifes and vice versa. As a rseult, I have found his medical advice to be very practical, calibrated to my personal ciecumstances–and thus more likely to be effective. Dr. Kahan is a fabulous doctor. He communicates complex concepts clearly, using simple, memorable concepts. He responds promptly to patient inquiries, using staff for support rather than as a shield as some docs do. He has extensive experience in weight management issues and is wonderful as a counselor. No matter whether I’ve lost weight or completely fallen off my plan, I always, always have a good experience a appointments with him and I always, always leave feeling confident and supported in my efforts, with new ideas and easily embraceable concepts. I lost over 35 lbs in less than 3 months under his guidance, and my journey is continuing. I expect to continue working with him consistently, albeit less frequently, in future years as I manage my weight issues at my goal weight. Dr Kahan is a rarity in the world these days – a doctor who genuinely cares about his patients as individuals, takes the time that each patient needs, actively listens to his patients, and seeks their participation and input in treatment decisions. His clinical skills are top notch, and his “bedside manner” beyond compare. Although at times appointments can run off schedule, generally no more than 10 min, it is because of the individual attention each patient receives – and I have no problem with a little longer wait because I receive that personal experience every time. I cannot recommend Dr. Kahan strongly enough, as a clinician, a caregiver, and an individual. Dr. Kahan takes the time to listen without making you feel rushed. His follow-up and communication skills are excellent — I feel like a partner in my own healthcare. A world class doc — one of the best and mos caring doctors I have ever had — he knows his stuff and is delighted to help. I started seeing Dr. Kahan several weeks ago for help with weight loss. 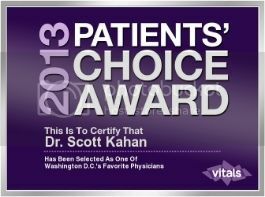 Scott Kahan is by far the most compassionate, empathetic, and helpful doctor whom Ive had the pleasure to encounter. Some doctors are good at acting like they care, but he really does, and is full of useful, helpful tips to boot. It is so rare to find a physician who is bright, engaged, genuinely friendly, and so well-informed in his area of expertise. He takes his time and answers any questions that come up, encourages email as an adjunct to office services, and is always available. If youre thinking about seeing him, GO! You wont regret it. He is solid, has deep knowledge of the science of weigth management and is able to connect to his patients in an extremely effective way. His enthusiasm and dedication led me to loose weigth and maintain a healthy level. My chemistries are back to normal, I am full of energy again. THIS DOCTOR STANDS OUT. It is so rare to find a doctor who is SO knowledgeable, so caring, and so enthusiastic about his practice and his patients. Dr. Kahan is an amazing guide through the weight loss process – he has helped me tremendously with this time, expertise, and ability to relate to my issues. I am so lucky to be working with him! Dr. Kahan is the best doctor I’ve had in my life. He takes plenty of time diagnosing conditions and working with me on solutions/treatments. He researches my issues in his spare time and follows up with me outside office hours to make sure I am doing OK, particularly this summer when a separate condition requiring bed rest prevented me from coming to the office to see him personally. He scheduled calls and sent e-mails to follow-up on me and was attentive and helpful during those sessions. You will not find a better doctor in metro DC. I have been seeing Dr Kahan for over a year. He is terrific. I wish he was my primary. What stands out the most is his care and commitment. He spends a lot of time both in inquiring into what has happened as well as in explaining what he is thinking. He has a great manner, almost a coaching approach to helping me strategize the lifestyle changes I needed to make. WE NEED MORE DOCTORS LIKE DR. KAHAN. Dr. Kahan’s approach to treating obesity and obesity-related conditions should be taught at every health care institution in this country. During my 25 years working in the industry, Ive never met a physician more generous with his expertise, wisdom, and genuine compassion than Scott Kahan. He is a truly nice guy. But most importantly, what Dr. Kahan recommends works: its based on sound medical and nutritional principles, focuses on change that can be sustained for a lifetime, and reflects a heroic effort to understand and encourage the individual being treated. We need a health care system that provides better rewards and incentives for physicians like Dr. Kahan, but until that occurs, Dr. Kahan can at least have the satisfaction of going home every day knowing that he is improving many lives. Dr. Kahan is insightful, considerate, and exceedingly bright. He is one of the best doctors I have ever had the pleasure of working with. As his patient, he kept me informed and focused. He motivated me to approach the principal medical issues I was burdened with with thoughtfulness. I would highly recommend him to anyone seeking professional help with weight loss and obesity. 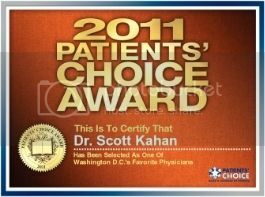 Dr. Kahan is an excellent physician. He is very smart and caring. He has extremely practical advice and support you throughout the entire process. What I like the best is I feel like he is on my side and always available. I lost 50 lbs with his help and he is the reason I am keeping it off too. Best doctor ever. Based on phone calls to the office, I was apprehensive about seeing a staff physician, but Dr. Kahan reached out to me and encouraged me to come in. I am so glad that I did. I learned an incredible about from him about nutrition and remain impressed by the amount of time he spent with me, by how attentive he was, and by his genuine concern. He literally changed my life. As the son of a physician, I’m often quite critical of doctors. Scott is among the best doctors you will ever meet. Kind, a great listener, incredibly knowledgeable, creative and resourceful in devising effective treatment plans — he is truly one of a kind. He shifted from a career as a brilliant research at Hopkins, perhaps the country’s leading health research shop, to focus on taking care of patients. Lucky us, Scott’s patients!! AMAZING RAPPORT. Dr. Kahan has a very amenable and calming presence. He shows genuine concern for his patients and puts them at ease gentle compassion. He is wonderful to work with and is always willing to “go the extra mile” to help his patiants. Not your typical doctor. Doctor’s appointments can feel overwhelming. You are anxious or trying to remember important questions to ask while you sit for what seems like forever in the waiting room and then in the patient room. When you finally see the doctor, every question you had quickly escapes your mind and the doctor is in and out in a matter of minutes. Well, I can tell you from personal experience it’s not like that at the GW Weight Management Program Office. Dr. Kahan is fantastic. You leave his office feeling like he actually cares about your health. He is very personable, follows up, flexible, and regardless of your financial situation he works with you. I highly recommend Dr. Kahan. Dr. Kahan is a caring and dedicated person. He takes an active interest in each persons., He is open an friendly.He wants to succed in your weight loss and helathey livingin goals. If it wasn’t for him I would have stopped going and would be in far worse straits.I trust him and I don’t trust many people. Dr. Kahan is one of those rare doctors who takes the time that his patients need – he genuinely listens and seeks active participation of his patients. Beyond his clinical skills, which are top notch, he is a kind and caring person who cares about and respects his patients. Dr. Kahan is accessible during and outside of his regular office hours. I would highly recommend him. I find Dr. Kahan to be very knowlegeable and thorough medically, as well as engaging and caring personally. I also findd that his medical advice was quite practical, and calibrated for my particular circumstances. I would not hesitate to recommend him to a friend or family member. Dr. Kahan is a supportive, attentive, thorough physician who deeply cares about the health and well-being of his patients. He provides the individual attention that is often absent in medicine in today’s world. He has excellent medical credentials as well and knows the answers to the most complicated medical questions. Dr. Kahan is a wonderful, caring doctor who listens and carefully considers your concerns and tries to address them. He very aware of all of the new developments in his field and works closely with your other doctors to coordinate your treatment. He also follows up by e-mail to make sure everything is going well. Dr. Kahan is absolutely outstanding. He has the perfect mix of clinical expertise AND outstanding interpersonal skills. He is the best physician I’ve encountered in 20 years. This is someone who really cares about the patient 24/7.